This post is filed under Chicken, Frozen, Green Beans, Lean Cuisine, Microwave, Pasta, Peppers, Plum Sauce, Sesame Seeds, Spaghetti. Yeah that was the big thing I noticed too….the soggy chicken. That would be awesome if they include ‘stix!! Do they have a disclaimer on the box about them not? Did you expect them to put the plate in the box, too? Should they include in forks when pictured on the box as well? I find it interesting that when it comes to chopsticks, it’s always mentioned in the commentary, but never other utensils. Why is that? Mainly because I’m lazy and writing about chopsticks is an easy way to fill space. 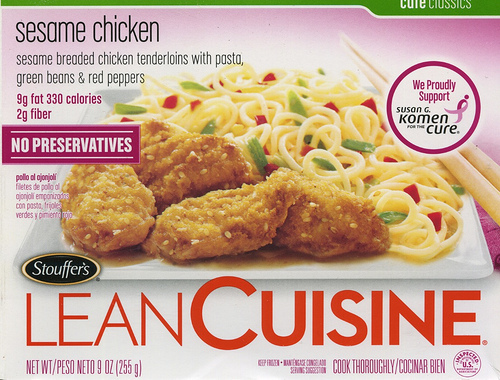 This is actually the first Lean Cuisine I have tried that I liked. I agree with your assessment of it, for the most part. 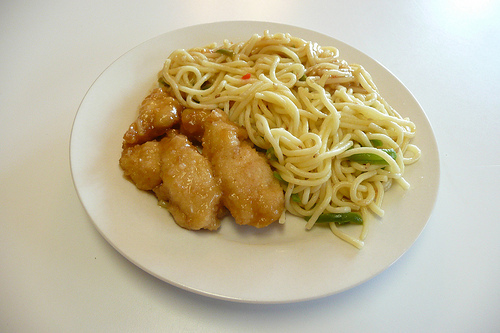 Only because it’s more novel…and would be awesome…and I love eating with chop sticks….and I think it would be a good cheap way for them to set themselves apart from other frozen food brands.